My trailer needs new tires. I have the original wheels (3). I know the T3-C trailers came with Firestone street tires (that is what was on the trailer when I got it also). We expect to use the trailer a fair amount off-road for carrying camping stuff. I am considering getting the military-style NDT tires as I expect they are a bit more robust/durable. But I don't really know if that is an issue. I will probably be getting the tires from Coker. Discount Tire is telling me they can get the tires and install them. They are also saying they won't need to use tubes. I could use some advice on that question. What are the opinions about which way to go with tires? Thanks for any thoughts/advice. I don’t and haven’t owned one of these trailers, so you should probably ignore what I say. If I had a trailer I would try to match the tires and wheels to my Jeep so I only needed one spare. Bias ply TUBE tires do not have a butyl layer called an inner liner that substitutes for a tube. Your tires May lose 10 PSI per month instead of 1-2 due to permeation. Match your tires to your Jeep so you can swap the spares around easily. Thanks everyone for the advice. Sadly, I don't have a jeep to match tires. It is a good idea but my truck tires aren't suitable for the trailer (unless I really discard keeping the trailer somewhat original). Those STA tires look like a good solution. I am going to look into those. Sadly, I don't have a jeep to match tires. I think you need to fix that! I have definitely caught the jeep bug wandering around this forum. I think trailers are a gateway drug to jeeps, haha. Get the 6.50-16LT super traxions, then you can buy them for the CJ when you get it. It's only a matter of time! That's right! Trailers are a gateway drug! Might as well jump right in, the water's fine! 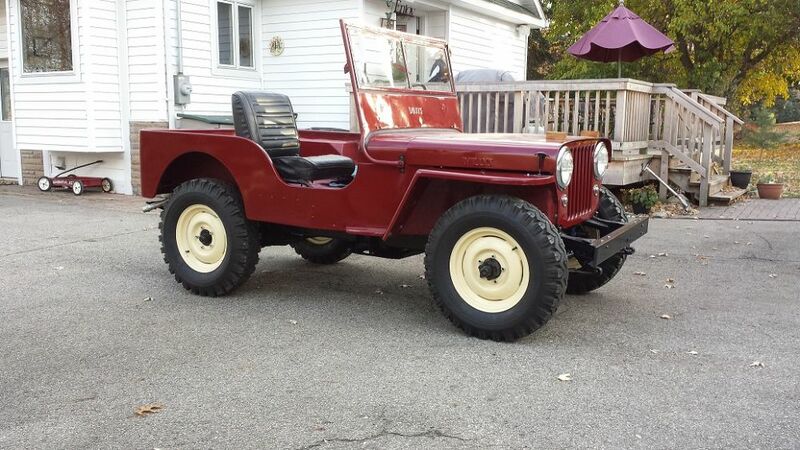 I am needing new tires for a cj2a. Looking for a radial mud snow tire for the original 16 inch rims. I need to know what size, brand and where to get them. Tire choice is really dependent on what you are going to use the Jeep for and how much money you want to spend. I have the Super Traxion's and they are great if you want a tire that will last forever, look like an old school snow tire, not break the bank, and get a little better traction in the snow than the NDTs. If you are serious about off roading, these are not a good choice unless you really enjoy the challenge. If you poke around this site there are several posts regarding tires. Running around amongst the trees without a spare seems risky; can't leave it on the side of the road as you drop off the flat for a plug/patch at the local service station. There are several projects where a spare mount is added to the trailer (either up front on the A frame against the front panel or underneath in back). Using tubes gives you the ability to patch the tire where otherwise might not be possible. Plus you may be able to do this on the trail (search bead breaking) with simple tools (like a bike tire-only bigger). I'm not sure, but I was of the understanding that those trailers used the same wheel as the jeep and therefore you could use the jeep spare if you had to. Yes, rims and bolt pattern are the same as the Willys. Double check your CJ has 16" rims/tires and then match the rims to the trailer. If you have NDTs on the jeep then use them on the trailer as they are a robust off-road tire for the trailer as well. Then you can use the jeep spare for the trailer. While the jeeps have very sturdy, reinforced spare mounts and plenty of hat channels to keep the weight of the tire and the flexing of the jeep side/rear skin, the trailers just were not designed to have that kind of weight and flexing which "tears" the metal. You will need to spread the mounting attachment points and use some steel reinforcement for the thin metal of the tub or you will destroy the tub if not properly supporting the tire and tire mount. This is why you are lucky if you are towing with a jeep that can share the spare mounted on it. Some have used under-frame mountings but they reduce clearance and unbalance the trailer when trying to hitch/unhitch it. Some use a mount attached to the drawbars which are sufficiently strong to prevent damage.